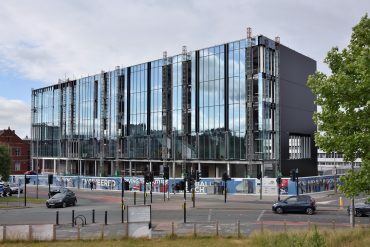 Works are well underway at University of Central Lancashire’s new Engineering Innovation Centre, in Preston. The glazing works were awarded to Dortech by main contractors BAM Construction and this fantastic new addition to the University was designed by architects Simpson Haugh & Partners. Dortech structural glazing system supplied by Technal for this project, including Technal MX62 visible grid curtain wall, finished in a matt-black powder coated paint. 200mm extended, square mullion caps were introduced to create a vertical aesthetic to the building facade. High performance, neutral, Saint Gobain CoolLite SKN toughened HST glass was used throughout the installation with glass heights exceeding 4.45 meters in height in some areas of the facade and weights of over 260Kg’s. Acoustic flanking achieved with the introduction of a high mass acoustic foam insert, which was inserted into aluminium sections. Previous Post Springfield Sixth Form Centre Completes Next Post Site Manager by Day, Hero by Night!